Today I have something totally awesome to talk about with you guys. I recently received a fun little package… we all know how much I love Balance Bar already from my previous review of their Balance Bare bar and the s’mores bar in my Energy Bar Wars post. Today I’m here to talk about yet another product by Balance Bar – Nimble bars! Flavor wise, I freaking love these bars. I knew I would. The other Balance Bars I have tried were a hit and I didn’t expect anything less than amazing – I was not surprised with the satisfaction the bar delivered for my taste buds. Needless to say, I’m super excited to have been introduced to these lower-calorie women-friendly bars. Then I also received a cute wristlet. It’s glittery and sparkly and it has a bright green inside. You’ll be happy to know that the little purse’s material is not one of those awful glitter messes that make your whole body glitter from the glitters that fall off – this is just a regular plastic material with glitter sheen infused in it. That sounded smart. I actually don’t know if that’s what you call it. Or if that’s how they make it. But it’s cute nonetheless. In addition to these bars and wristlet, I have something else to introduce to you guys: Laurel House, lifestyle expert and the woman behind the QuickieChick website, has come out with a book – “QuickieChick’s Cheat Sheet to Life, Love, Food, Fitness, Fashion and Finance on a Less than Fabulous Budget.” That’s a mouthful. The book is full of quick tips that help out in all of the categories mentioned in the title. QuickieChick is filled with professional advice from business entrepreneurs, exclusive tips straight from celebrities, insightful anecdotes from real women who have “been there and done that,” end of chapter cheat sheets that simplify the steps to success in concise & actionable advice, and fun quizzes that help you find out who you really are. This is the perfect rescue handbook for post-grad girls about life and how to live it… fabulously on a budget. In sum, what do you get if you win this giveaway? 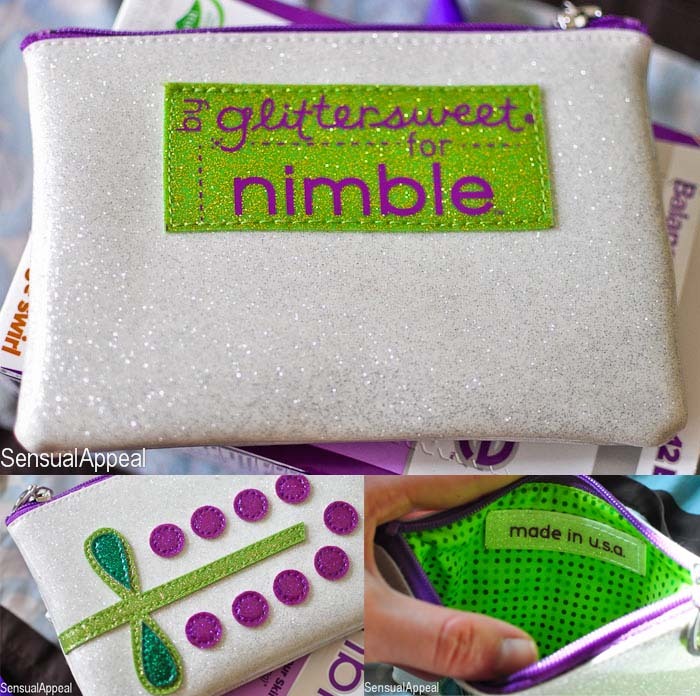 The nimble/Quickie Chick Gift, valued at $109, is not available for sale. 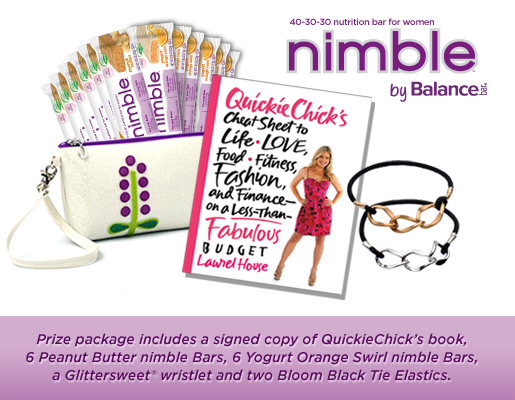 Balance Bar will ship the nimble/Quickie Chick Gift to one U.S.-based winner. This giveaway will be open until Thursday, June 14. I’m subscribed to your email posts. I’m following Balance Bar on Twitter! I follow Balance Bar on twitter! i don’t have a facebook… but i do have a twitter and i do follow you on twitter and i tweeted! THANKS! Following you on FB as Koupon Kat –Thanks! The orange yogurt swirl bars are yummy! Found your page through Healthy Diva Eats. Love it! I followed you and tweeted. Thank you for the great giveaway!